Wellington poet and publisher Mark Pirie reports for Beattie’s Book Blog from the Basin Reserve in Wellington on their new touch screen interactive display incorporating players, broadcasters, cricket music, comedy and poetry. If you’re looking for a place with an amazing jukebox, check out the New Zealand Cricket Museum in the Old Grandstand at the Basin Reserve. I was there last weekend to see the new interactive sound display that has just opened. The new display is much like a jukebox in that you touch the screen to select what you want to hear. The kiosk contains a menu of options: Players, Broadcasters/Commentators, Music, Comedy and Poetry. 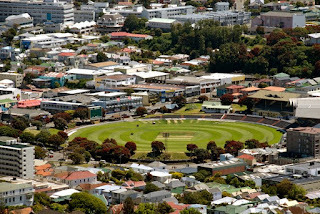 For cricket tragics it is cricket heaven. As a music fan and former dee-jay I spent most time in the Music section. A lot of time has gone in to scouring You Tube in Google searches for cricket songs. The list of tracks you can hear includes the seminal cricket songs like 10CC’s ‘Dreadlock Holiday’ and Sherbet’s ‘Howzat’ as well as a punk tune from Half Man Half Biscuit, reggae from Gypsy, folk from Victory Calypso, pop from Duckworth Lewis Method (‘Meeting Mr Miandad’), Dave Stewart, and Paul Kelly, rap from Mr B The Gentleman Rhymer (‘Straight Outta Surrey’) to the fan songs of the Barmy Army. Their video for the 2004 Ashes song was hilarious with Australian captain Ricky Ponting chased by Barmy Army supporters. It ends with Ponting put on a hot air balloon and sent back down under. For those of a more serious historical disposition on the game, there are many recordings gathered including commentators like Jim Reid, Cyril Crawford, and Peter Sellars commenting on various games. Recent broadcasters like Bryan Waddle, Jeremy Coney and Peter Sharp are also included. The Comedy section features some fine moments including a recording of one of Don Bradman’s speeches, and a segment from TV3 of the Beige Brigade Awards. This is the clip where former Black Cap Lou Vincent receives a fielding award. Vincent dives near the boundary to collect the ball and is unlucky to find his pants rolled down near his ankles. He gets up and fires the return in before adjusting his trousers naturally. Perhaps the most significant entry into the jukebox is Poetry as it’s unusual for a cricket museum. David Mealing, the museum director, thinks it could be a first in the cricket world. It wasn’t until my anthology, A Tingling Catch, appeared that the museum had knowledge of New Zealand cricket poetry. They have taken to the book with aplomb, and have featured many poems from the book in the touch screen interactive. Most of the poem recordings are by a studio voice and trained actor who makes a wonderful job of the Rasta muffin lyric ‘When Hadlee Bowls the Ball’ by Colin Croft and the Maiden Overs. They asked me to read my own poems: ‘To Bert Sutcliffe, Master Batsman’, ‘The Record’ (on Martin Crowe), ‘A photo of Martin Donnelly and Keith Miller at Lord’s’ and ‘At Lord’s’ for the recording. Wellington poet/publisher Helen Rickerby gave her voice to the female poet’s poems by Jenny Powell and Elizabeth Smither. Other poem recordings are by David Mealing. Some of the other poets included are Kevin Ireland, Robin McConnell, Ian Donnelly, J H E Schröder, Brian Turner, Harry Ricketts, Whim Wham, Graham Lindsay, Ron Riddell, David Mitchell, Jack Perkins and Des Williams. Williams’s excellent Glenn Turner poem ‘One Hundred Tons of GMT’ sent into the museum is not in A Tingling Catch. Other exciting features of the new interactive are photos of players like Bert Sutcliffe, John Reid, Geoff Howarth, Evan Gray, Shane Bond, Chris Harris, Ken Wadsworth, Sir Richard Hadlee, Glenn Turner, Mark Richardson, Martin Donnelly, Martin Crowe and Jeremy Coney. Their player profiles and statistics are included on screen, and another innovation is that by touching their photos, the interactive brings up options relating to the players, i.e. poems, photos, commentary and video footage, if and where available. If you look up Glenn Turner, his brother Brian Turner is on the screen with him, and you can listen to Brian’s poem for Glenn, a nice touch. For Crowd Goes Wild presenter Mark Richardson, there is funny footage of him falling over at the crease from cramp. Shane Bond’s video clip shows his bowling highlights set to the James Bond theme tune. An enormous amount of work and funding ($52,500 mostly from the Museum’s operating budget, New Zealand Community Trust and the Wellington Cricket Trust) went into putting the display together. David Mealing undertook much research in tracking down archival footage of players, photos of players, broadcasters and poets, recordings of music and match reports, and approving copyright. David deserves congratulations. It really is perfect for school groups and young people to whet their appetite for cricket history. He has compiled a perhaps unprecedented display in cricket museums worldwide. We are very lucky to have it in our own country and for public use at the Basin’s New Zealand Cricket Museum. Museum hours: 10.30am-3.30pm weekly until 31 May. Winter hours: 10.30am-3.30pm weekends only or by arrangement. Ph: (04) 385 6602. The interactive content will be available on the web in the near future. Mark Pirie is a Wellington poet, writer, editor and publisher. He is currently involved in co-organising the Poetry Archive of New Zealand Aotearoa (PANZA) and researching early or forgotten New Zealand poets. His books include editing A Tingling Catch: A Century of New Zealand Cricket Poems 1864-2009 and a new edition of Michael O’Leary’s cricket novel Out of It in 2012, both through HeadworX.